Games: a range of poker variants and tournaments including Texas Hold’em, Omaha, Razz, Five Card Poker and more. It’s been awhile since we’ve seen a new poker venue emerge and the new Guts Poker site has been well worth the wait. Guts Casino has been a long running favourite of ours, beloved for its wide range of high quality casino games from leading game developers like NetEnt and Microgaming, and the newly launched Guts Poker site is the perfect accompaniment for those who want to take their online poker play to the next level. Guts Poker is powered by the acclaimed Microgaming Poker Network, featuring a heap of poker tables and tournaments available around the clock, along with several alluring promotions to boost your winnings further. With hundreds to thousands of active players online at any given time, Guts Poker is recommended for those wanting to hone their poker skills and challenge players from all over the world in a safe and reputable space. $1K welcome bonus – Every player who signs up for an account with Guts Poker is rewarded with up to $1,000 in free money. This generous welcome bonus is released in $5 instalments, where for every $25 you deposit to your account you’ll automatically receive an additional credit of $5. There are no wagering requirements attached to this offer, just cold hard cash. The only catch is you only have 60 days from registering to take advantage of this bonus, so don’t hesitate to make your first deposit. $10K Sit ’n’ Go Challenge – if sit ‘n’ go’s are your thing, opt-in to the $10K SNG Challenge to earn points that could put your name on the leaderboard to earn you a pay-out portion of some big prize pools. There are four tiers to join, with your total score calculated by the total amount of points you manage to gather in 10 consecutive SNGs. The Guts Poker software, by the MPN, is available in two forms – either in instant play mode with games accessible directly over your web browser, or by downloading the exclusive Guts Poker client. The best part is, since September 2016 the poker client is available not just for PC users, but Mac users too. The software download comes recommended by the Guts team, but both play formats provide access to the same poker tables and promotional offers, so the choice is yours. Whichever way you choose to play, poker games are available for free play and real money bets. 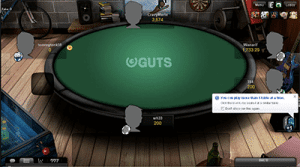 To download the poker client head to Guts.com and click on the Poker link. If you already have an account with Guts Casino, you can use the same login details to play at Guts Poker, you’ll simply need to create a poker alias for yourself which will be displayed when you’re playing at any of the poker tables or participating in any tournaments. For those who are entirely new to Guts, follow our links to register for an account with Guts and take advantage of this fabulous welcome offer of up to $1,000 in free money. Once you have your poker alias all set up, choose to either download the poker client or use instant play. You’ll then be redirected to the poker table lobby, where you can select from the room variants using the tabs at the top of the page. Select the poker game you with to join, click on ‘join table’ and once the game loads, use the chips to place your bets and start playing. What poker variants are available at Guts.com? 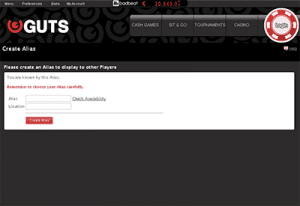 Guts Poker has a special focus on tournament style play, with tonnes of tourneys available to suit all bankrolls. To see which poker tournaments are active, click on the tournaments tab at the top of the poker client – from here you can switch between these tournament categories: All, Guaranteed, Satellites, Freerolls and Specials. New players are encouraged to take part in the New Player Freerolls, which gives you the opportunity to try tournament play for free if you opt-in within seven days of signing up. Guts’ New Player Tournaments are hosted weekly and upon registration you’ll be invited to participate in these New Player Freerolls for the next six weeks. There are two free tournaments available to new players – the $1,000 New Player Freeroll and the $500 New Player Turbo. Each of these payment methods have a limit of a $10 minimum and $5,000 maximum deposit, except for Paysafecard which allows a maximum deposit of $200. All transactions are processed instantly so you can start playing poker for real money as soon as you’ve entered your payment details. Guts Poker is protected by premium digital SSL (Secure Socket Layer) encryption, which scrambles all information sent over a secure browser to keep your personal details safe from hackers. When playing in the Guts Poker rooms, you also have the option of playing at one of the Anonymous Tables, which means your alias and avatar are only visible to you and you can’t see other players’ information. These Anonymous Tables are recommended for players who are extra cautious about their online privacy. For an instant reply, click on the live chat option to speak directly with a customer service representative.